A view of Ama-no-hashidate, Tango Province, from Shokoku meisho hyakkei, the “Hundred Views of Famous Places in the Provinces.” An uncompleted set of 81 prints published by Uoya Eikichi between 1859-1861 (this being 10/1859). The place name can be translated as “Bridge to Heaven” and it’s considered to be one of the most beautiful areas in Japan. Seen here under a full moon. 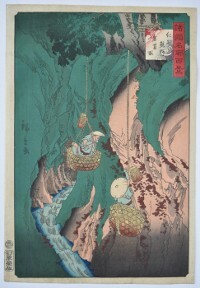 Superb impression of the first edition: One of the earliest pulls from the blocks. Fine colour and condition. 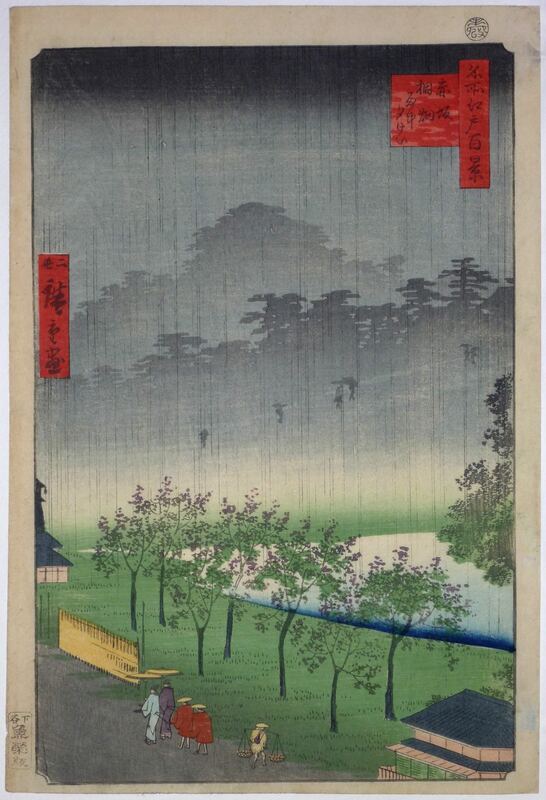 Signed Hiroshige ga.
Yoroi no watashi, “Yoroi Ferry” from the set Toto sanjurokkei, “Thirty-six Views of Edo.” Published by Ai-To, 1862. Shows the laden ferry crossing in heavy snow. 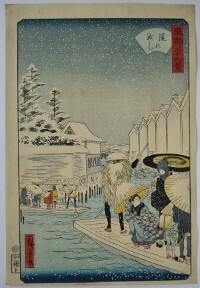 The Koami-cho warehouses on the right. 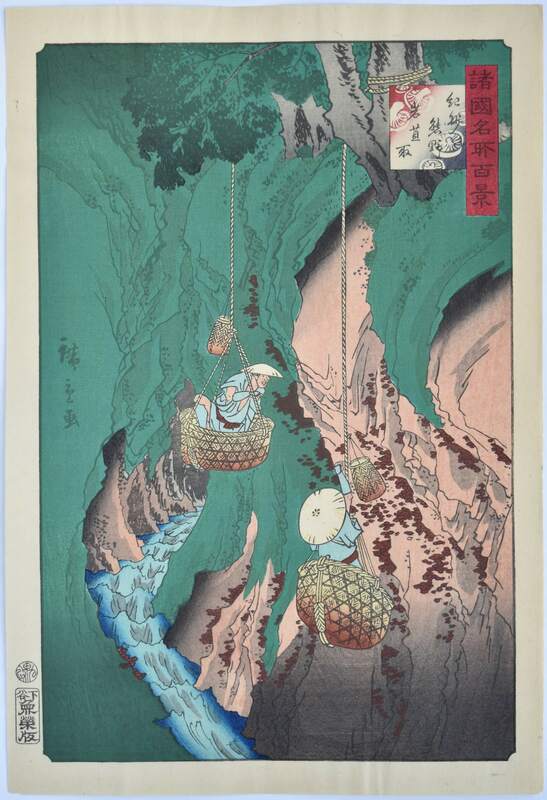 Gathering iwatake, rock tripe or rock mushrooms in Kii Province. The common name for various edible lichens that grow on cliffs. The gatherers used precarious baskets that were hauled up and down the cliff face to collect them. 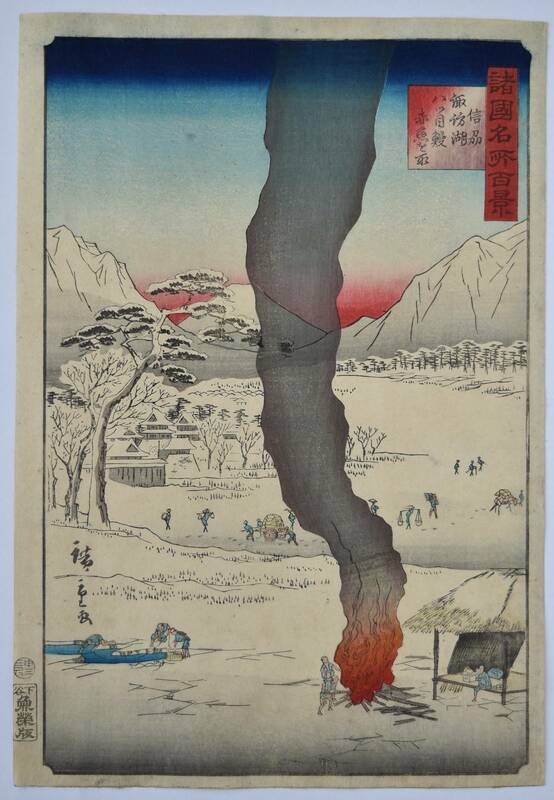 Kishu Kumano iwatake tori from Shokoku meisho hyakkei, “One Hundred Views of Famous Places in the Provinces.” Published by Uoyei 1859-1861 (this being 1860). 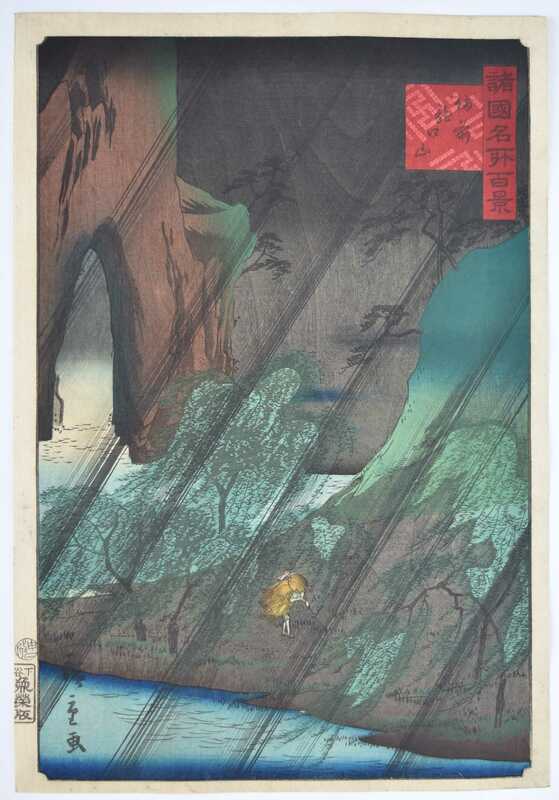 A fascinating print. Superb impression and colour of the first edition. Repaired binding holes in left margin, otherwise fine condition. 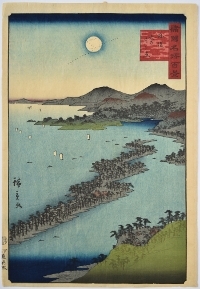 Signed Hiroshige ga.
A true view of Muro Harbour in Harima Province, Banshu Muro-no-tsu, from Shokoku meisho hyakkei, “One Hundred Famous Views in the Various Provinces.” The set published by Uoya Eikichi, 1859-61 (this being 1859). Superb impression of the first edition. Fine colour. Small backed binding holes in right margin, otherwise fine condition. 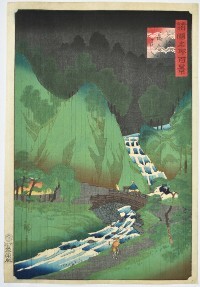 Signed Hiroshige ga.
Shinshu Suwa-ko yatsume akauo wo to (ru). Shinshu (Shinano) Province from the “Hundred Views of Famous Places in the Provinces.” An uncompleted set of 81 prints published by Uoya Eikichi between 1859 – 1861 (this being 1860). A winter scene showing figures catching lampreys, eels and red rockfish in Lake Suwa. 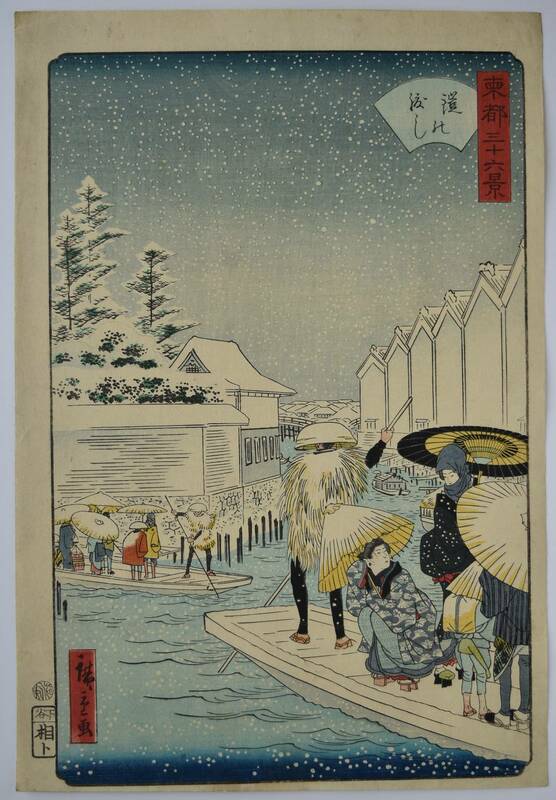 The lake was unusual in having warm currents beneath the ice, even in mid winter. 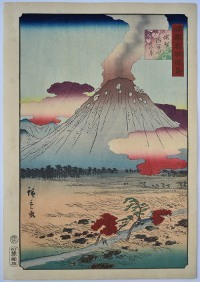 Fine impression of the first edition. Fine colour. Very slight edge soil, otherwise fine condition. 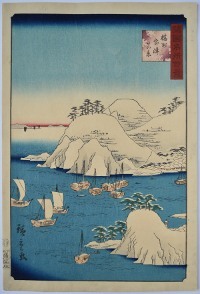 Signed Hiroshige ga.
Hiroshige II’s best print. 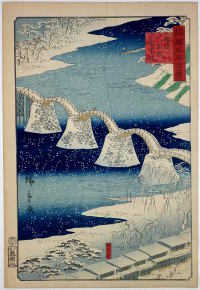 Suo Iwakuni no Kintaibashi, “The Kintai Bridge, Iwakuni in Suo Province.” From Shokoku meisho hyakkei, “One Hundred Views of Famous Places in Various Provinces.” Published by Uoya Heikichi 11/1859. 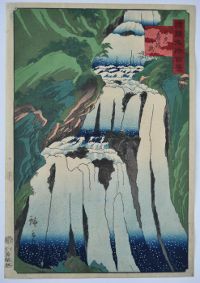 The rare first edition has a variegated sub-cartouche but this is still an extremely early impression with the green on the banks top right ( missing on later editions ); light blue on the water, and gradation and mica on the roofs at bottom. Fine colour. Small repaired binding holes in left margin, otherwise fine condition. 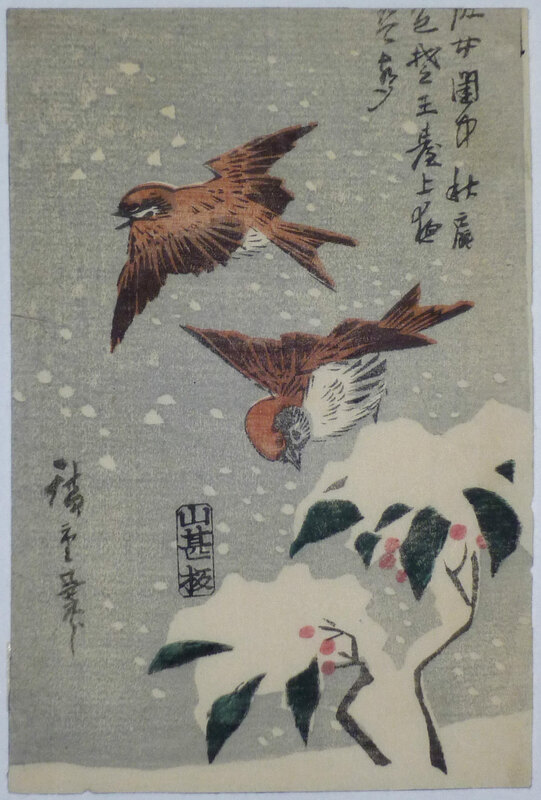 Signed Hiroshige ga.
A quarter-block, 6.5 x 4.25 in; 16.5 x 11 cms, print showing two tree sparrows flying in snow over snow-covered bushes. 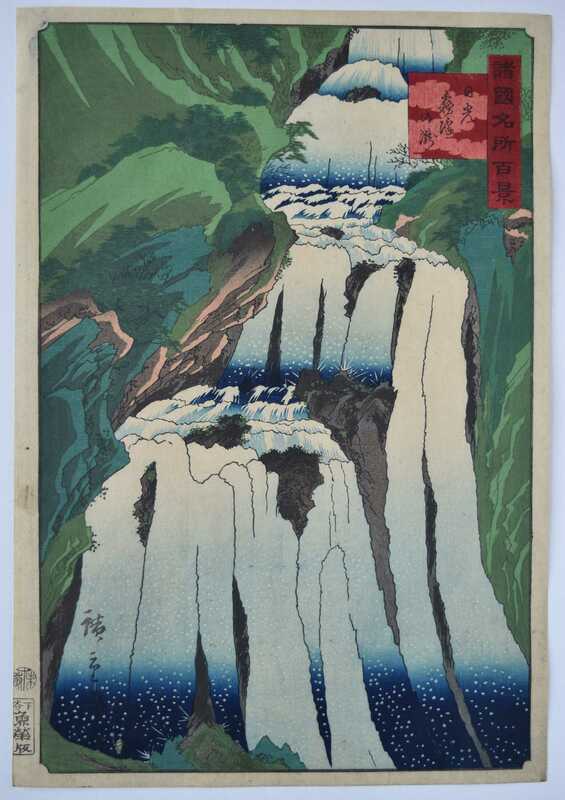 Published by Yamashiroya Kambei (?) c late 1840s. Ex collection Paul-Louis de la Noe, 1879-1919, ( an acquaintance of the Goncourt brothers, Bing and Hayashi ). Possibly unique. 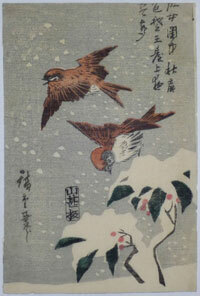 A half block, 8.5 x 6.5 in; 22 x 16 cms, print showing a tree sparrow and hibiscus. 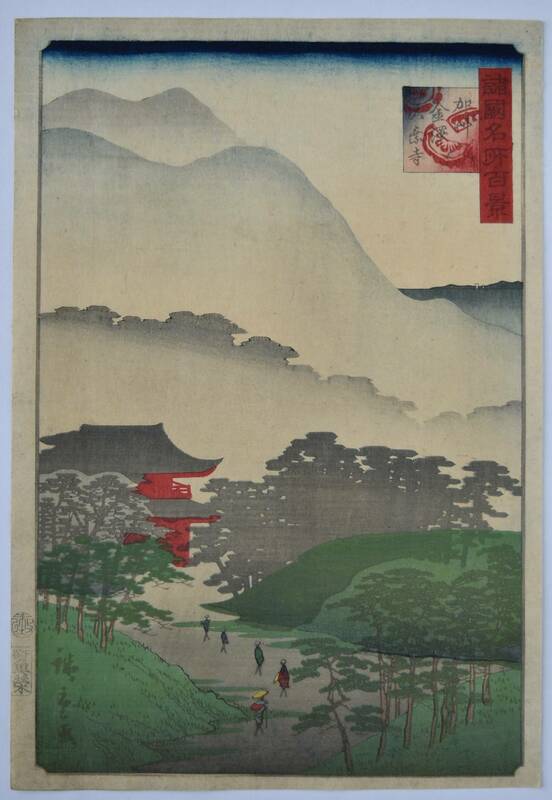 From a series of prints by the same publisher, Yamashiroya Kambei (?) 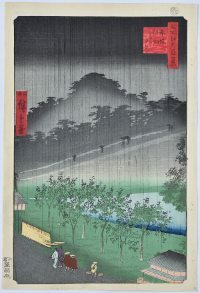 published 1851-53 ( Kunugasa and Murata seals ). 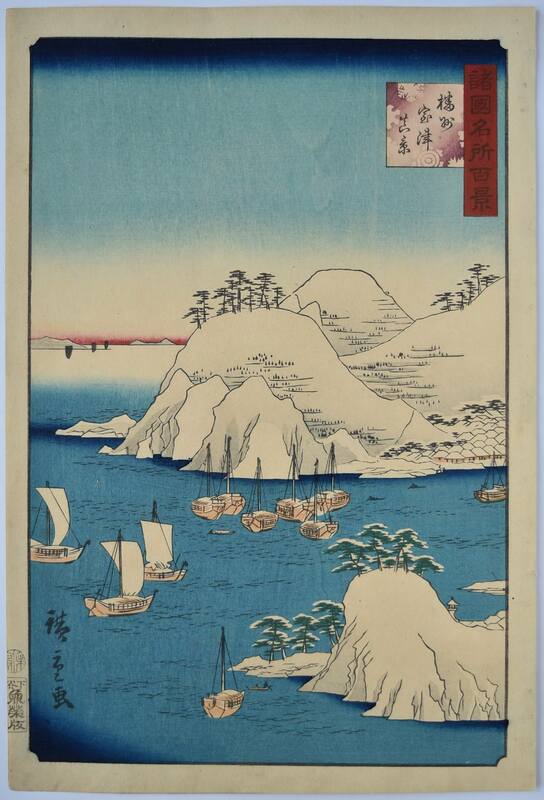 Probably Hiroshige IIs best set in this genre. Ex collection Paul-Louis de la Noe, 1879-1919, ( an acquaintance of the Goncourt brothers, Bing and Hayashi ). Very good impression and colour. Very minor soil. 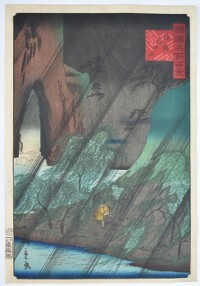 Signed Shigenobu hitsu. 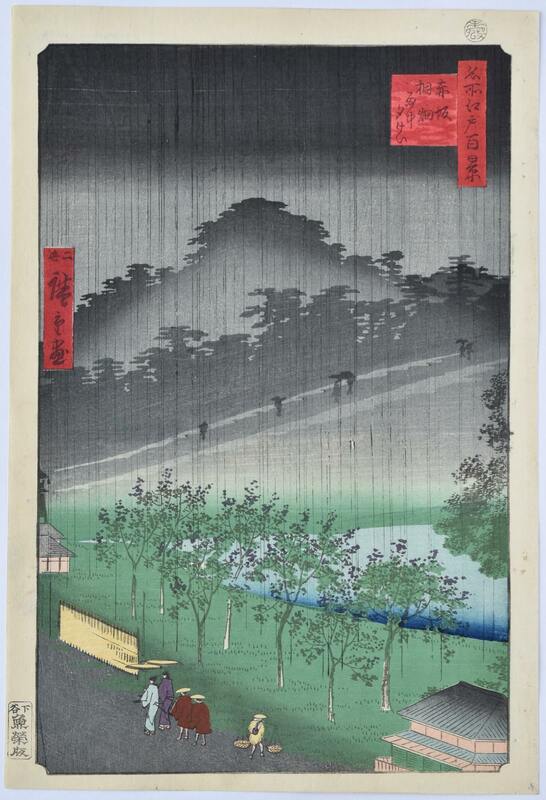 Akasaka kiribatake uchu sekikei, “Evening View of the Paulownia Plantation at Akasaka Under Rain.” This is the replacement design for Hiroshige I’s version Akasaka kiribatake for the Meisho Edo hyakkei, “One Hindred Views of Edo” published by Uoya Eikichi between 1856 and 1858. 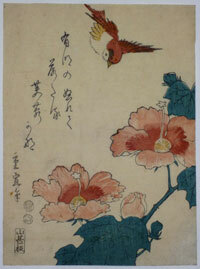 This design dated 1859. Presumably the blocks were damaged for the first composition. 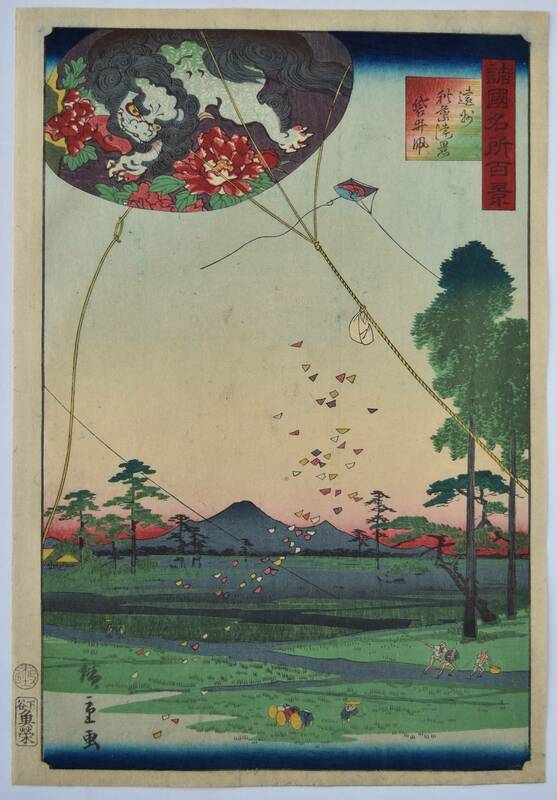 A fine design and superior to Hiroshige I’s. Fine early impression with mica to sky. 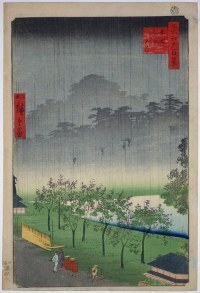 There is an extremely rare first edition of this print with an added gradation of yellow to square cartouche and gradation on the yellow fence at left and roofs at right. Otherwise, the impressions are the same. 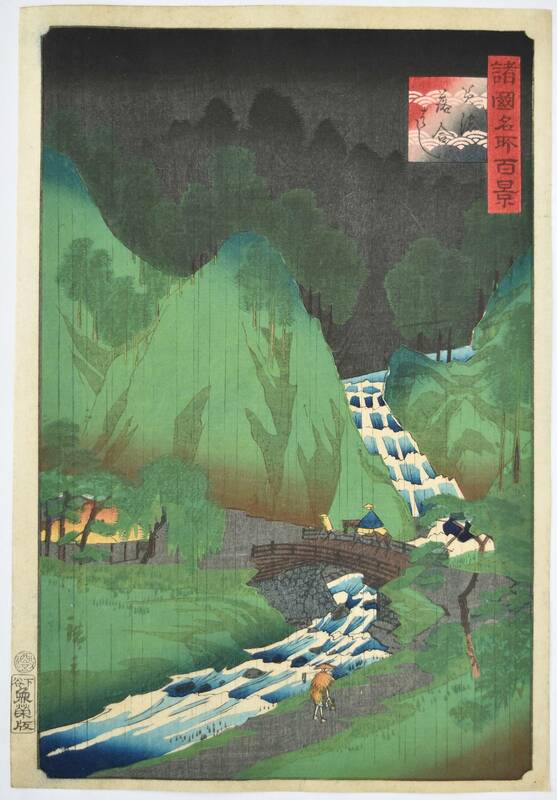 The gradation in the background is particularly fine here. Fine colour. Slight soil to margin, otherwise very good condition. Signed Nisei Hiroshige ga.